I don’t know about you, but in my opinion, the only thing better than a great paranormal romance is a series of paranormal romance novels. Even better, when they are well developed, making it impossible to be put down. 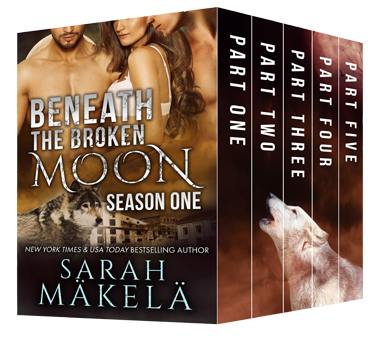 This is why I was excited to see the release of the collection Beneath The Broken Moon by Sara Maekelae arrive this week! I might not be able to pronounce her name, but I am nevertheless a fan. And maybe one of you, my dear readers can help with that? Also, I included a giveaway at the end of the blog post, for a chance to win an Amazon gift card – so you can buy more books of course! Beneath the Broken Moon: Season One is available on Amazon now!